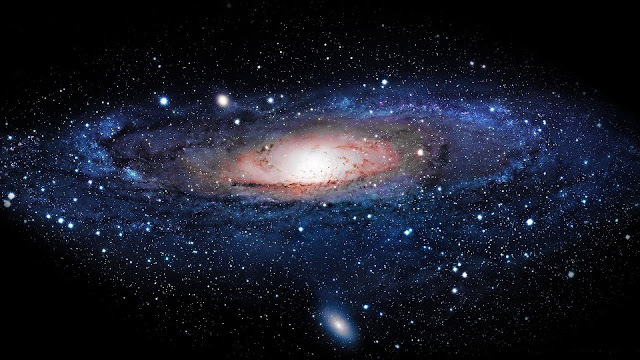 Home Scientific life Biggest galaxies in the universe were formed in cosmic oceans of cold gas!!!! Biggest galaxies in the universe were formed in cosmic oceans of cold gas!!!! Using radio telescopes in Australia and the US, an international team of scientists has discovered that the biggest galaxies in the universe develop in cosmic clouds of cold gas. Until now scientists believed that these “supergalaxies” formed from smaller galaxies that grow closer and closer together until they merge, due to gravitational attraction. “In the local universe, we see galaxies merging and we expected to observe that the formation of supergalaxies took place in the same way, in the early (now distant) universe,” said first author Bjorn Emonts, researcher at Centro de Astrobiología (CSIC-INTA) in Madrid. To investigate this, telescopes were pointed towards an embryonic galaxy cluster 10 thousand million light years away, in whose interior the giant Spiderweb galaxy is forming, and the scientists discovered a cloud of very cold gas where the galaxies were merging. This enormous cloud, with some 100 thousand million times the mass of the Sun, is mainly composed of molecular hydrogen, the basic material from which the stars and the galaxies are formed. Previous studies had discovered the mysterious appearance of thousands of millions of young stars throughout the Spiderweb, and for this reason it is now thought that this supergalaxy condensed directly from the cold gas cloud. Instead of observing the hydrogen directly, the researchers traced carbon monoxide, which is much easier to detect. “It is surprising how cold this gas is, at some 200 degrees below zero Celsius,” said the study’s second author Matthew Lehnert, a researcher at the Astrophysics Institute of Paris. For the study, the researchers combined the interferometers VLA (Very Large Array) in New Mexico (US) and the ATCA (Australia Telescope Compact Array) in Australia. “Using sensitive observations of carbon monoxide, we show that the Spiderweb galaxy — a massive galaxy in a distant protocluster — is forming from a large reservoir of molecular gas,” said the study published in the journal Science. Using radio telescopes in Australia and the US, an international team of scientists has discovered that the biggest galaxies in the universe develop in cosmic clouds of cold gas. Until now scientists believed that these “supergalaxies” formed from smaller galaxies that grow closer and closer together until they merge, due to gravitational attraction. “In the local universe, we see galaxies merging and we expected to observe that the formation of supergalaxies took place in the same way, in the early (now distant) universe,” said first author Bjorn Emonts, researcher at Centro de Astrobiología (CSIC-INTA) in Madrid. To investigate this, telescopes were pointed towards an embryonic galaxy cluster 10 thousand million light years away, in whose interior the giant Spiderweb galaxy is forming, and the scientists discovered a cloud of very cold gas where the galaxies were merging. This enormous cloud, with some 100 thousand million times the mass of the Sun, is mainly composed of molecular hydrogen, the basic material from which the stars and the galaxies are formed. Previous studies had discovered the mysterious appearance of thousands of millions of young stars throughout the Spiderweb, and for this reason it is now thought that this supergalaxy condensed directly from the cold gas cloud. Instead of observing the hydrogen directly, the researchers traced carbon monoxide, which is much easier to detect. “It is surprising how cold this gas is, at some 200 degrees below zero Celsius,” said the study’s second author Matthew Lehnert, a researcher at the Astrophysics Institute of Paris. For the study, the researchers combined the interferometers VLA (Very Large Array) in New Mexico (US) and the ATCA (Australia Telescope Compact Array) in Australia. “Using sensitive observations of carbon monoxide, we show that the Spiderweb galaxy — a massive galaxy in a distant protocluster — is forming from a large reservoir of molecular gas,” said the study published in the journal Science.